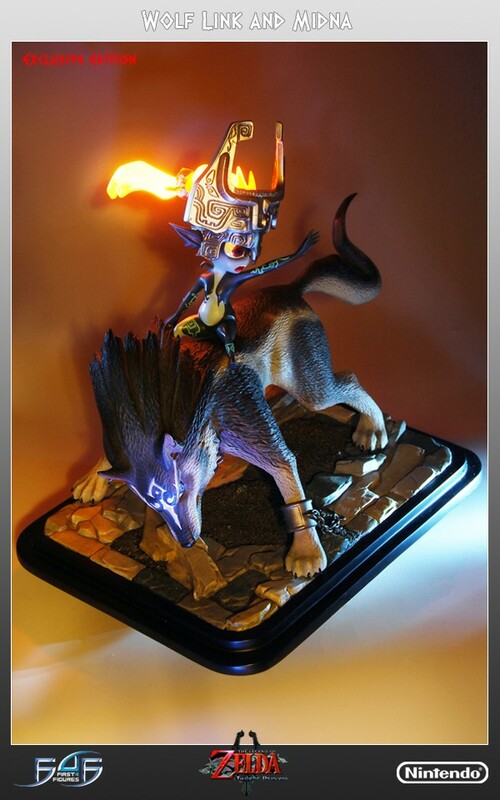 The Legend of Zelda Twilight Princess 1/4 Scale “Master Arts” Wolf Link and Midna Exclusive Center Piece. 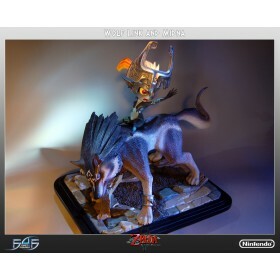 You will earn 1,750 F4F Reward Points for purchasing this product. 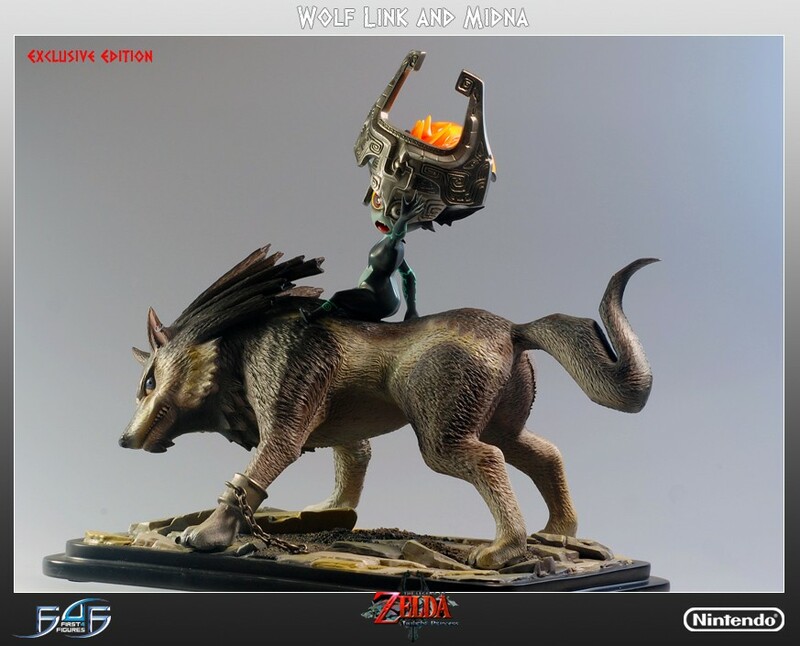 First 4 Figures is hugely proud to present Wolf Link and Midna, the second in the 1/4 scale “Master Arts” line of Twilight Princess Center Pieces. 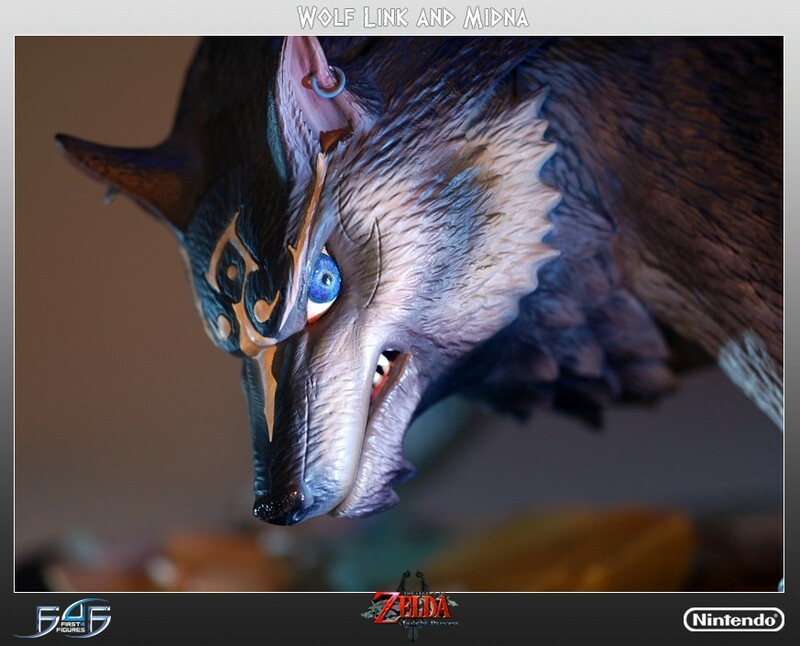 Wolf Link is the sacred blue-eyed beast in Twilight Princess who is transformed into this Wolf form due to the influence of the ever expanding Twilight covering Hyrule. His whole body changes and reforms and leaving only his earrings and distinctive blue eyes. 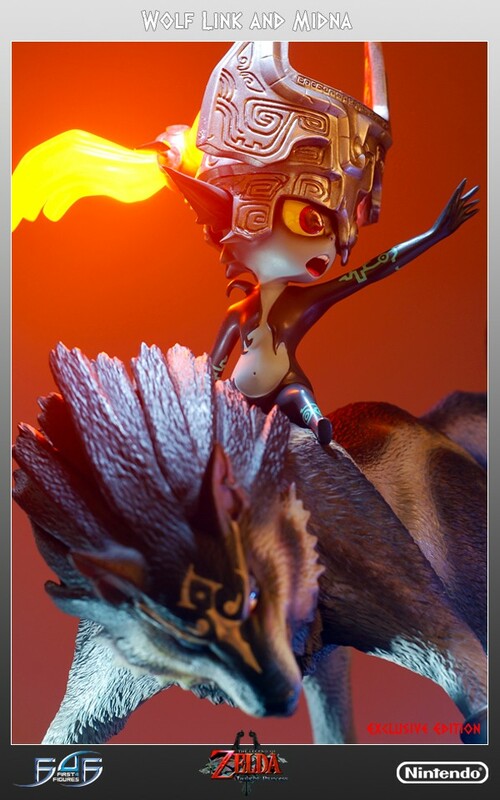 In this form, Midna rides on Link's back giving directions and allows him to warp using the Twilight Portals created across Hyrule. 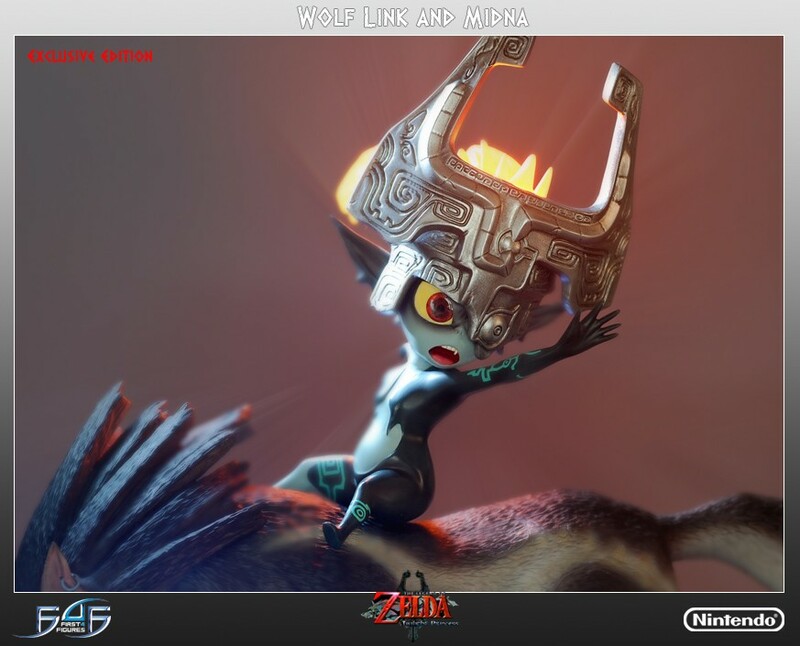 Midna is one of the Twili, a race descended from wielders of powerful and evil magic who were banished to an alternate dimension by the goddesses Din, Farore, and Nayru. 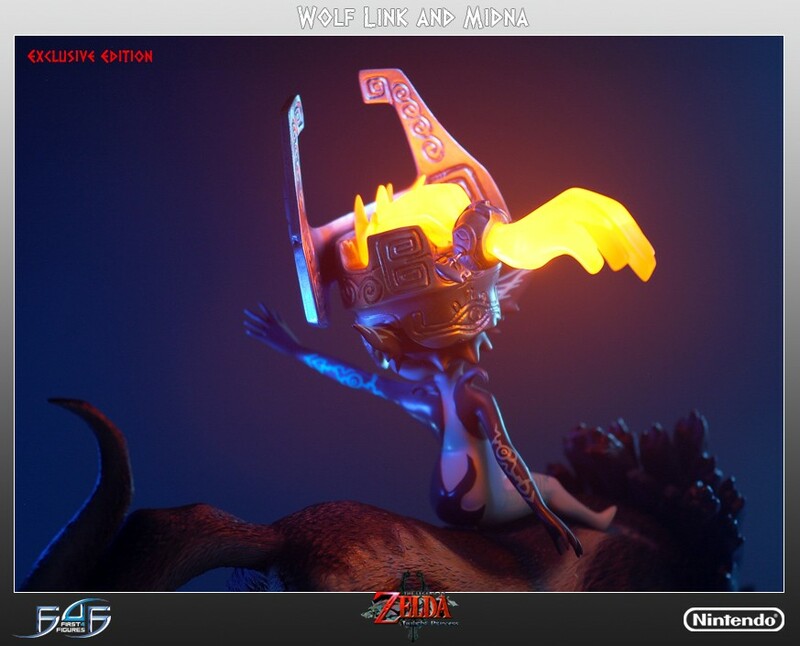 She teams up with Link to battle a "greater evil" that she alone cannot overcome. 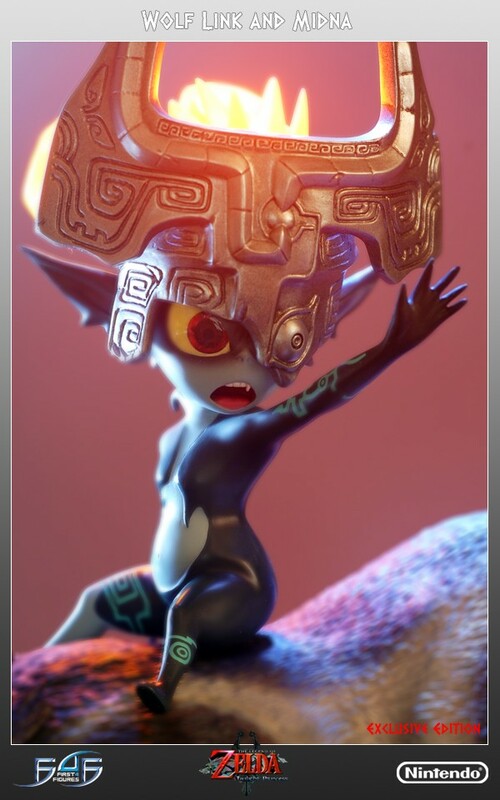 Midna wears her distinctive helmet and reaches out her arm as a warning. 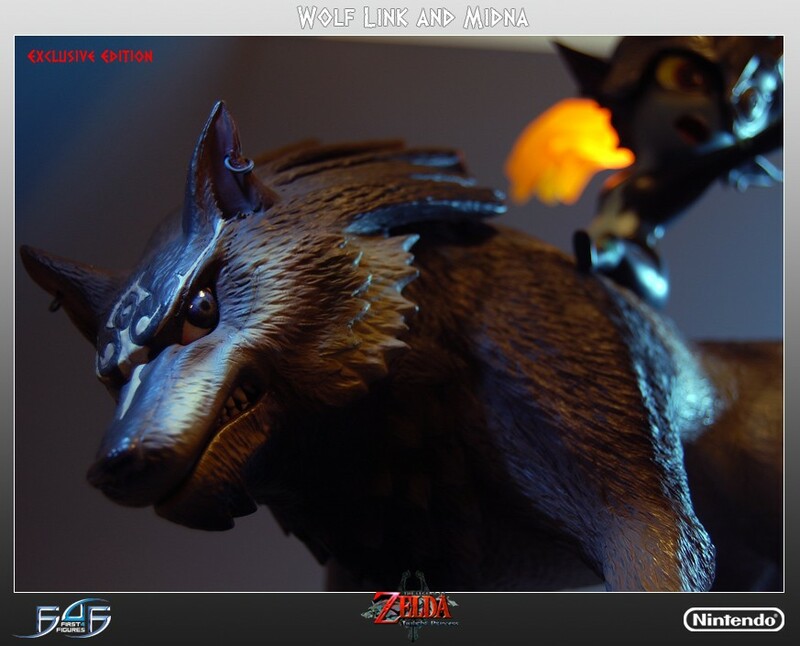 Wolf Link turns and snarls. They are working in perfect unison. 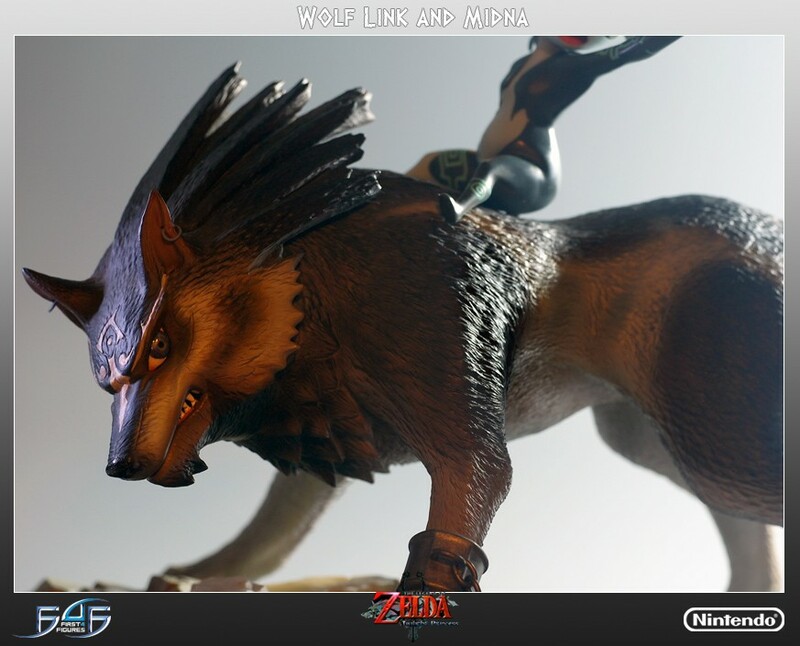 The Wolf Link and Midna statue captures every aspect of this iconic duo with stunning realism. 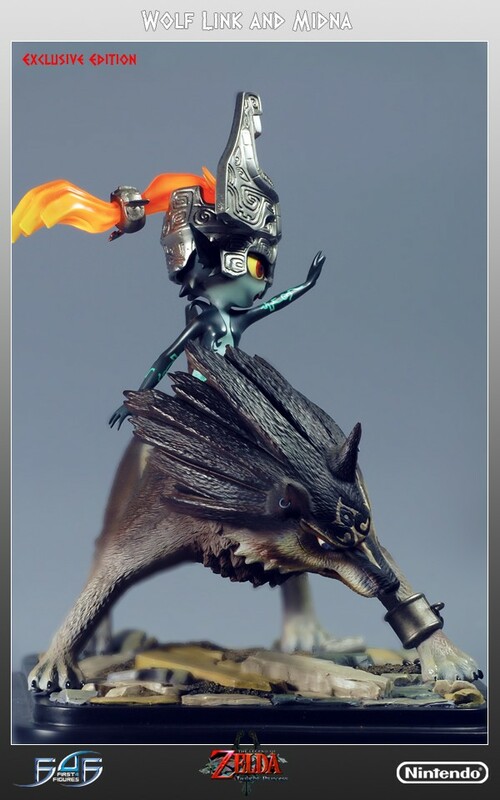 Each piece is individually painted and finished to exacting standards. 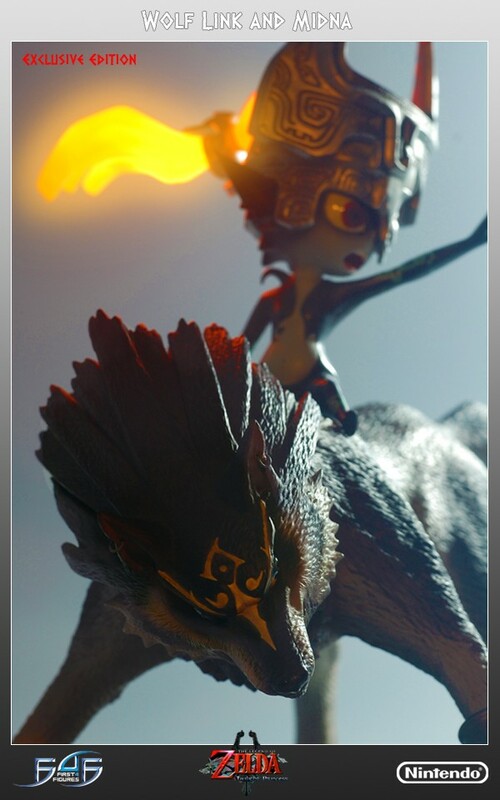 They are an amazing addition to your Zelda display. 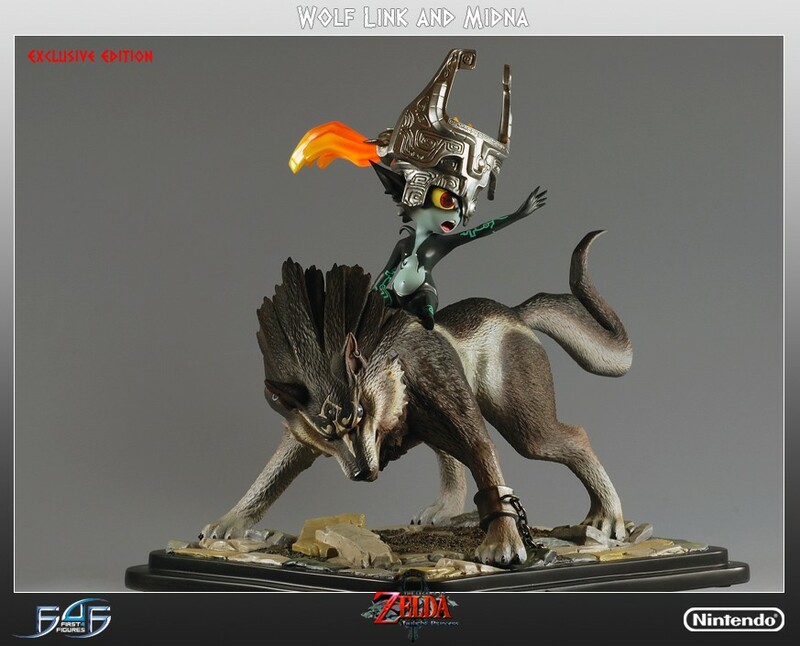 This is the exclusive version of Wolf Link and Midna, only available at First4Figures.com. 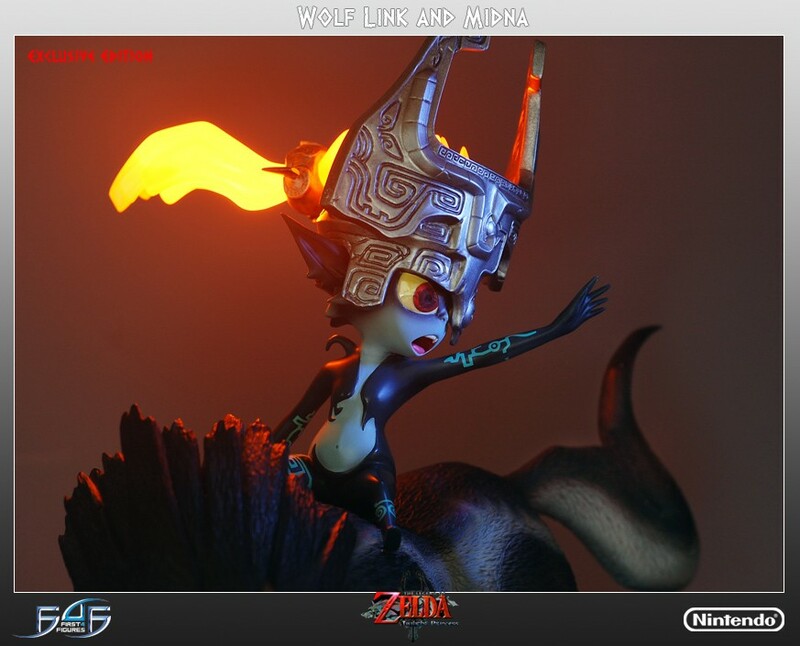 Midna’s hair lights up which accurately portrays Midna’s power. 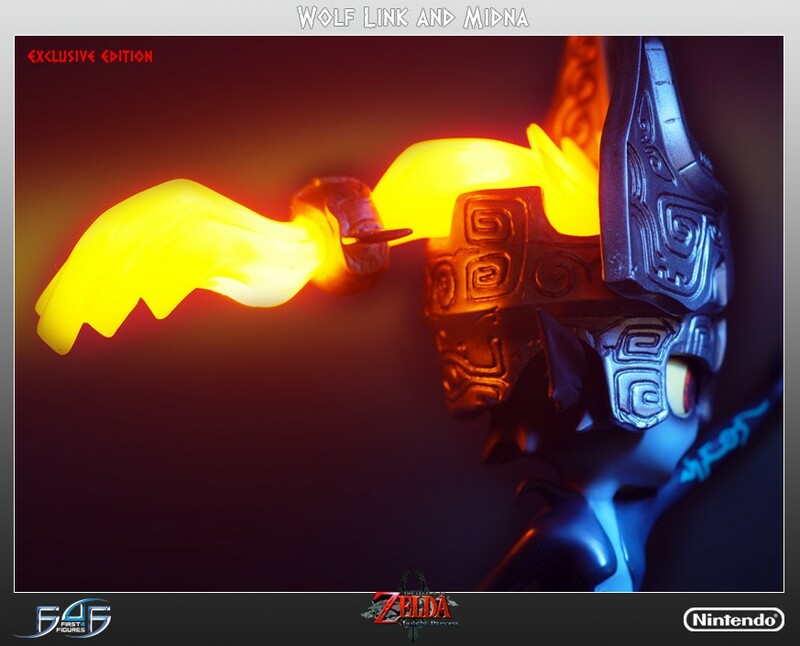 The lights slowly fade out after you turn them off. 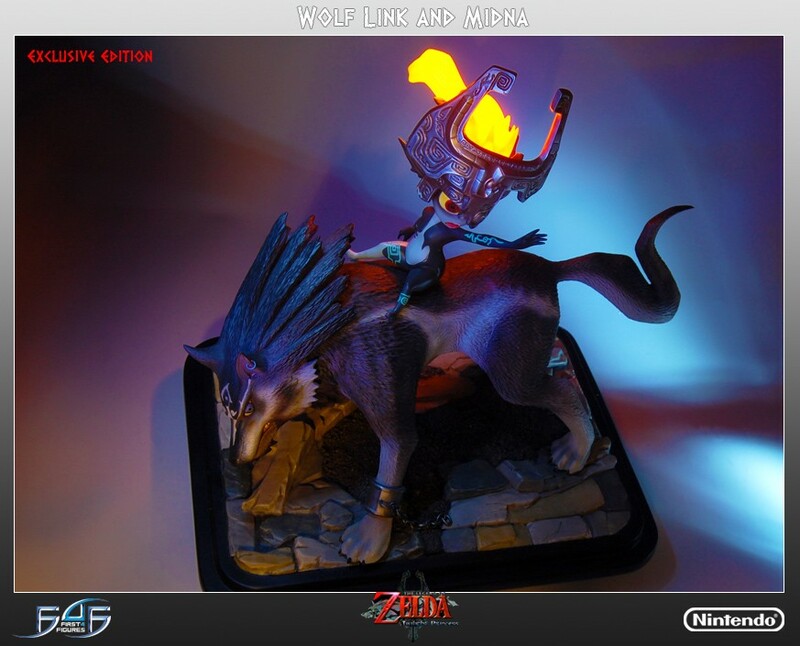 The lights are powered by batteries. 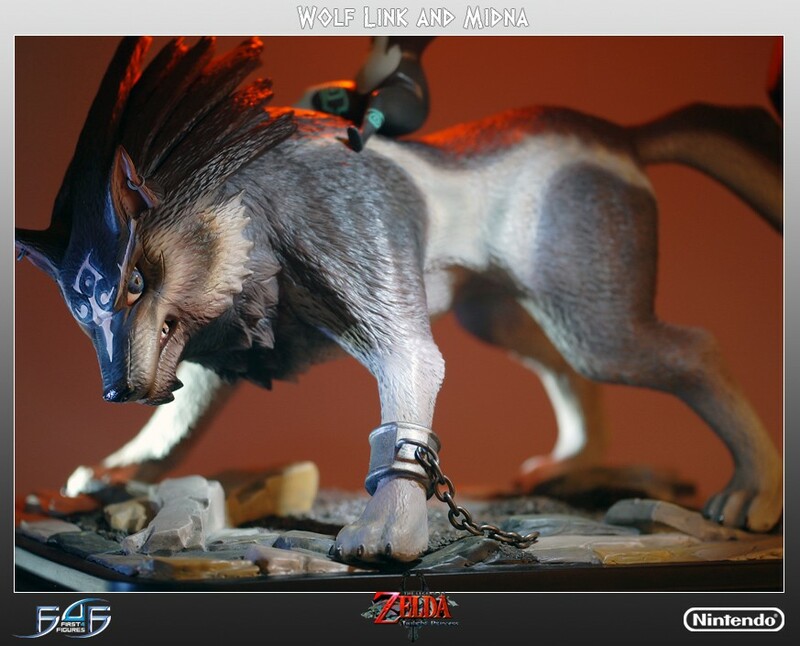 At 1/4 scale, they measures approximately 15 inches tall and 15.5 inches long. 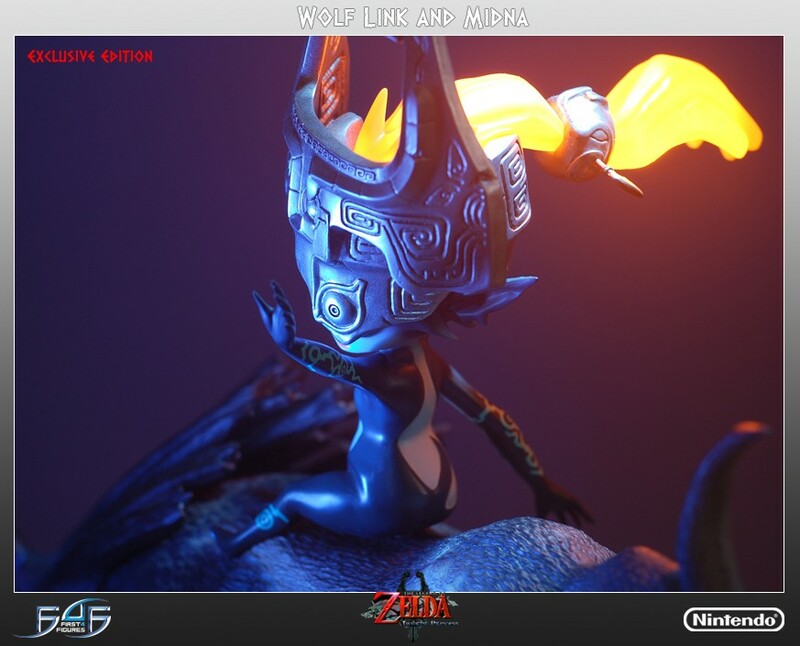 Cast in high quality poly-stone, the statue is hand finished and hand painted. 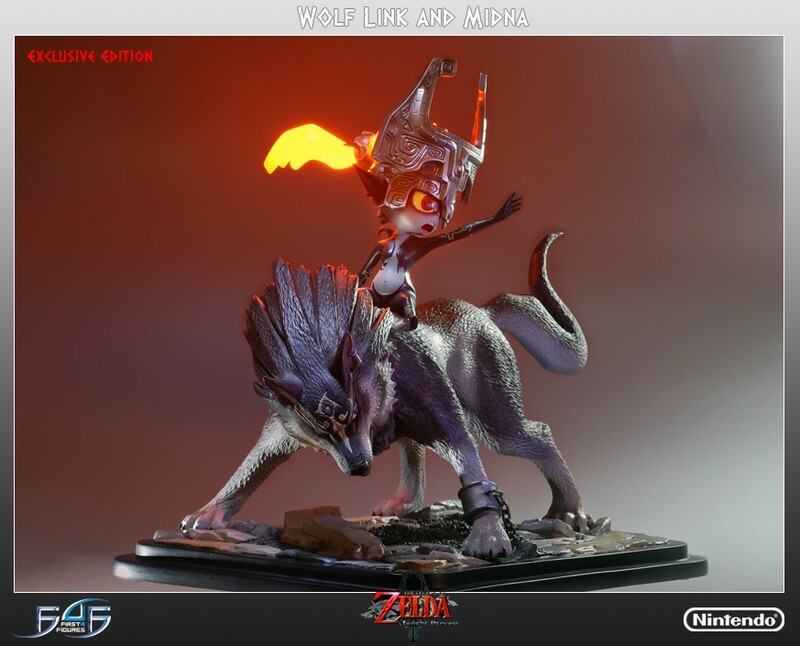 Working with the official Twilight Princess game files has allowed First 4 Figures to faithfully recreate Wolf Link and Midna’s distinct style and add fine detail. 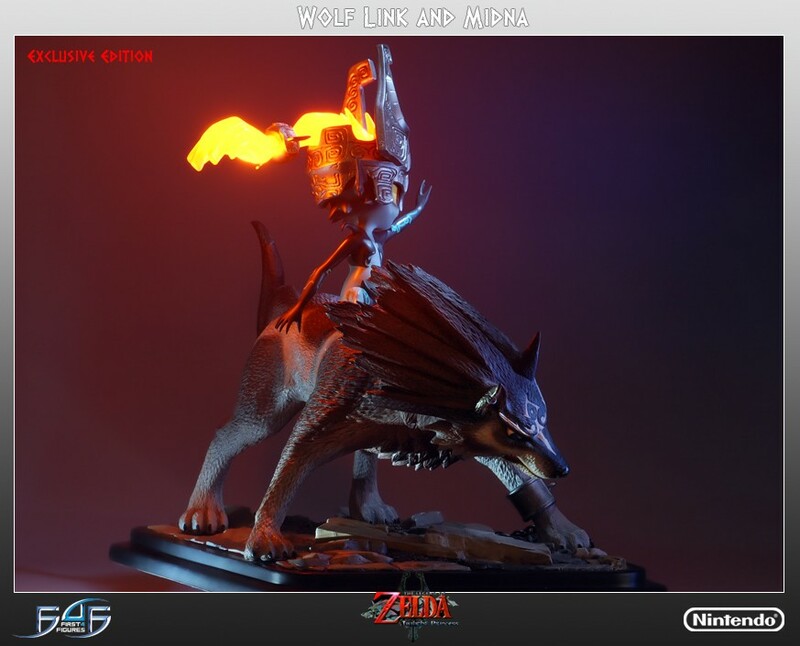 They comes in deluxe full color packaging, hand numbered base, and includes an Authenticity Card which allows you to purchase the same number of the model next in the 1/4 Scale “Master Arts” Twilight Princess Center Pieces range. Highly Limited to 500 pieces only worldwide. 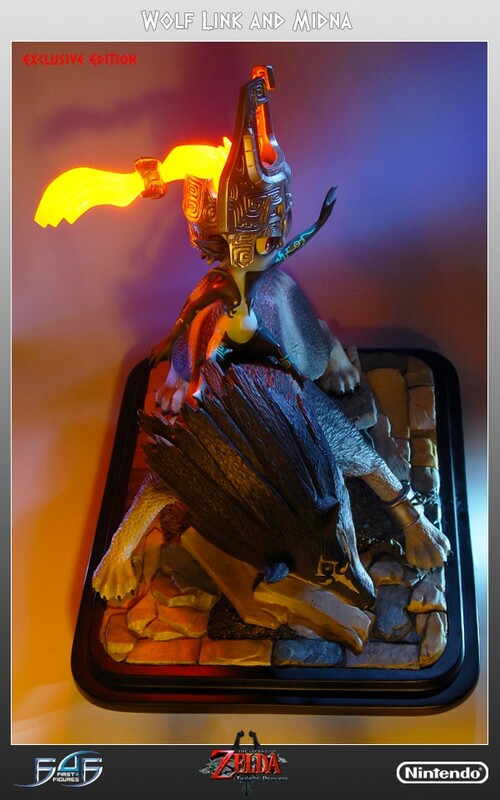 This is the second in the Twilight Princess 1/4 Scale Master Arts range. 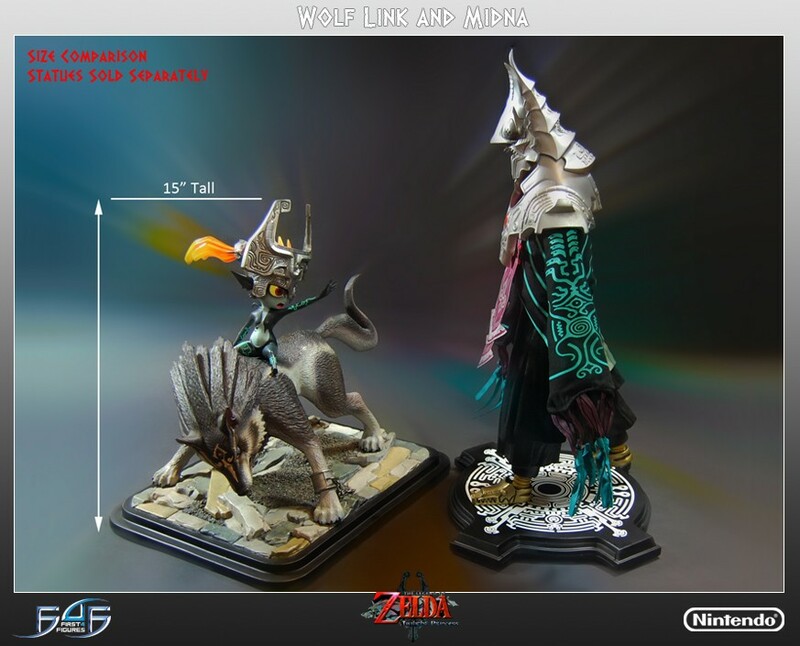 If you wish to collect the same product number, you must authenticate your previous statue in the series (Zant). 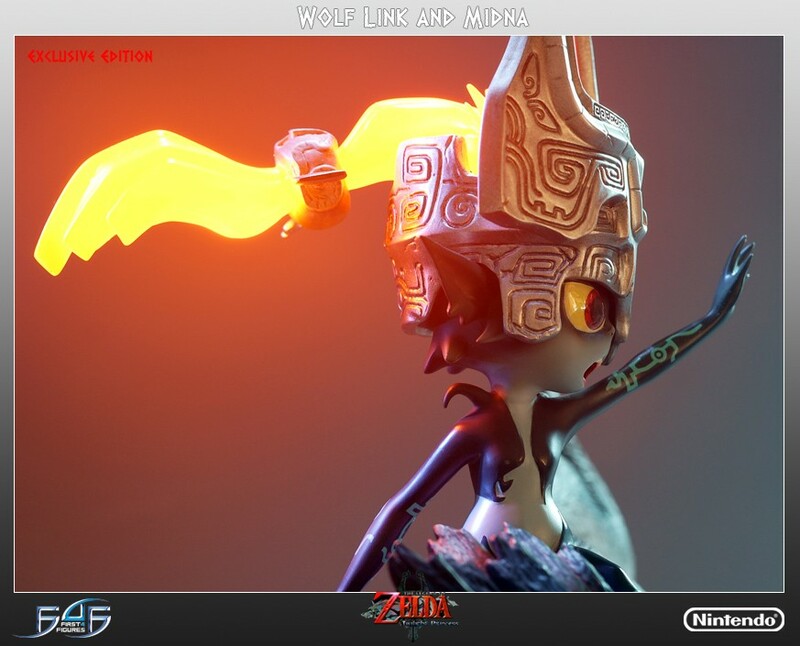 An amazing rendition of the original game artwork and models that will literally light up any collection.